Karlsruhe is an interesting city, much rebuilt after damage inflicted during the Second World War. The main focus of the city is the palace of Prinz Karl-Wilhelm from which the streets radiate out from. The pedestrianised main shopping street and the Marktplatz is served extensively by trams and many interurban lines, including the Albtalbahn (AVG) which run long distant services to the north and to the south into the Black Forest. The electric tramway started in 1900 and is built to the standard gauge of 1435mm. The fleet is made up of 14 GT8 Duewag trams dating from 1972, all immaculately presented in the fleet livery of yellow and red, 45 Duewag/Siemens GT6-70, 20 Duewag/Siemens GT8-70 and 25 Vossloh Citylink NET 2012. Some of the Tram-train fleet is also seen on the programme, mostly of Duewag manufacture. Our filming starts in the early morning at the busy Bahnhofplatz and then moves along Augarten, Ettlinger and Karl Friedrich Strasse. Action is also captured at the very busy junctions at the Marktplatz and Kaiserstrasse. We return to the Bahnhofplatz via Konzerthaus, Karlstrasse and Erbertstrasse filming at each of these locations. Our next location is Darmstadt in the region of Hessen, a small town south of Frankfurt-am-Main. Electric trams started here in 1897 and run on metre gauge track. 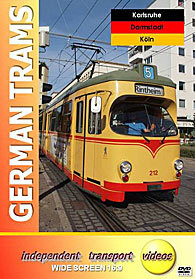 The trams cover a large area beyond the central area, out to towns such as Alsbach and Griesheim. The smart fleet consist of 10 Waggon-Union/AEG GT8, 20 LHB/Adtranz NGT8D and 18 Alstom/Bombardier NGT8D as well as 30 low floor trailers. The livery is blue and orange on a white base. Some cars also carry overall advertising liveries. Filming starts in the central area at Luisenplatz during the busy late afternoon rush capturing all of the action. We then film the trams at high speed along Rheinstrasse as we move along to the Hauptbahnhof to complete our visit to Darmstadt. Our final visit is a brief one to Köln. Filming takes place at Neumarkt. The fleet, KVB, is now made up mostly of Bombardier products running in a red and white livery, of which are number are filmed during a busy Saturday afternoon.